These shumai are nicely soft even when chilled, and are perfect for bento boxes. Shumai is a type of traditional dumpling that originates in China. They can sometimes be seen at dim sum restaurants. These shumai are lightly flavored, making them easy to pair with a variety of other dishes. They are also great as an introduction to shumai for anyone who has never tried this type of dumpling before. 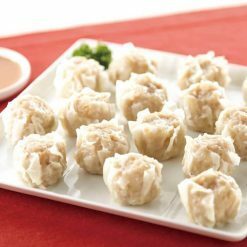 Some shumai become stiff if not served hot or warm, but these shumai remain pliant; and can conveniently be prepared in the morning and packed or stored for use later in the day with no rewarming necessary. Dumplings such as these make great snacks, appetizers, or side dishes, paired either with other traditional-style dishes or with modern fare. Making shumai from scratch at home can be frustrating as well as prohibitively time-consuming, but Sugarlady’s frozen shumai can be ready to eat in mere minutes; with very little prep or cleanup to worry about! Our goal is to make it easier for you to serve your favorite foods anytime, even on your busiest days. Set up your steamer. Once it begins producing steam, place a sheet of baking paper inside and add the shumai (still frozen). Steam for 8 to 10 minutes on high heat.The shumai will be very hot after steaming, so please use caution to avoid burns. This product contains [Filling] Pork, vegetables (onions, ginger), potato starch, granulated soy protein, sugar, egg whites, table salt, sesame oil, Yesso scallop extract, seafood extract seasoning, pepper [wrappers] wheat flour.. This product is not suitable for anyone with allergies to egg, wheat, soy, pork or sesame. Origin of ingredients: pork/onions (domestic). Prepared and packaged in Japan.